Lily can hardly believe that her parents are sending her away to boarding school in Chicago instead of taking her with them on their sabbatical to Germany. She certainly doesn't fit in with the polished, rich, and ultra-spoiled students of St. Sophia's School for Girls. The only person she can consider a friend there is her suite-mate, Scout. Scout is a little odd, but fun and unique, and she and Lily bond quickly. But Lily can't help but he a little alarmed at Scout's sudden disappearances and mysterious nighttime activities, so she follows her one night and stumbles upon an epic fight against underground evil forces she never knew existed...but yet she is connected to it nonetheless. 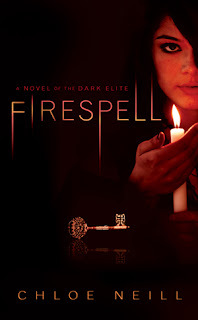 Firespell by Chloe Neill is a good, quick read if you're a fan of supernatural and want to lose yourself in something light. It is a little slow in the beginning and Neill spends a bit too much time working up to Lily's discovery of Scout's night job, but there are a handful of good little mysteries embedded throughout the book to keep the reader engaged. Sadly, the characters don't stray too far from St. Sophia's, so the Chicago setting really isn't explored very much. And of course, as with most books set in a boarding school, there is a surplus of trite girl drama that most readers will probably want to skim over. The back-cover summary suggests more action than there really is, and what little evil-conquering there is is concentrated at the very end. However, Neil does focus more on friendship and loyalty than romance with any boy, which is gratifying to see, and the sequel, Hexbound , seems to promise more action and more answers to some unanswered questions. This is an easy and slightly predictable read. Cover Comments: This cover is what ultimately made me start reading this--I love the candlelight and the shadows and how it reveals only bits and pieces of the girl's body. Very intriguing! That cover would have drawn me in too!